This invite-only paper toy series brings together artists from around the world, who each design their piece of totem! Invited artists are challenged to custom this blank paper toy canvas with their own style and vision. 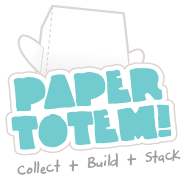 All created Paper Totem! designs are available for free download for you to collect + build + stack. The PAPER TOTEM! project was launched in May 2009. Its first year marked 99 designs, by 36 friends and over 130.000 downloads by you lovely people! Thanks so much to all of you involved! To see if you've got Series 1 complete, feel free to check out the collector's check list here. Multiple artists. Individual designs. One PAPER TOTEM!